Reserve A Mountain Escape Today! Cabin needs updates, such as the furniture, very uncomfortable couch and chair. The pool table room was nice but to small to actually play pool. Not many decorations as I’ve seen other cabins. No yard whatsoever. One of the bedrooms had a bag of chips left from the last guest, food was found on the floor of the cabin. Despite having to pay $80 in cleaning fees, I expected it to be cleaner. The customer service was exceptional, easy to check in and out! Overall it was a nice stay. First time I used Cabins USA. Everyone was so nice and helpful. The cabin was wonderful. We would give the rating 10 all the way. We had another great stay with Cabins USA. A mountain escape is very clean and in a great location. A little tight parking for 2 vehicles and not necessarily recommended for older adults and small children. This is due to the living area being up very steep stairs and the bedrooms downstairs. Other than that we were VERY satisfied. And yes, I read reviews but didn’t realize exactly how steep stairs were. But the cabin itself is in great condition and in a great location with easy access to PF. My two little boys loved hearing the train from Dollywood blowing its whistle. Thank you Cabins USA and the owner of this cabin for a great vacation. Thank you so much for taking the time to leave a review! We are glad you had an enjoyable vacation with your family in the Smoky Mountains. We hope you will come stay with us again in the near future. A new washing machine has been added to this cabin for the convenience of our guests! The cabin was great, it was clean and equipped with the necessities. Just a few minor issues, the hot water did not stay hot long enough for five consecutive showers. It was five adults in the cabin and after the second adult showered, the others had to wait for the hot water to replenish. The other issue was the room that the pool table is in is not big enough, however, it worked out. I would use CabinsUSA again, however not this particular cabin being it is along a main road. NO LIGHTING ON THE PORCH WITH THE HOT TUB. AFTER WALKING AROUND THE CABIN BEAR FOOTED FOR ABOUT AN HOUR, OUR FEET WERE SO BLACK. FLOORS WERE DIRTY. WE ALWAYS TAKE OUR SHOES OFF AT THE DOOR. WE DON'T WEAR SHOES IN THE HOUSE. WE HAD TO WASH OUR FEET BEFORE WE COULD PUT SOCKS ON TO GOT OUR TO DINER. WHEN WE USED A WHITE WASH CLOTH IT WAS BLACK. I EVEN TOOK PICTURES OF MY FEET BECAUSE I COULD NOT BELIEVE HOW DIRTY THEY WERE. WHEN WE GET CHARGED A CLEANING FEE, WE WOULD THINK IT WAS CLEANED BEFORE WE CHECK IN. FLOORS WERE NOT MOPPED. OTHER THAN THAT IT WAS A NICE PLACE. There is this constant humming noise coming from the closet downstairs. It is some electronic box with a fan noise that kept me awake for a long time. Could still hear it with pillow over my head. Virtually no privacy between the bedrooms. Nice location, but traffic is noisy when sitting outside on porch. Very busy country road, not condusive to a quiet time when chilling on the front porch. This cabin was in a convenient location with easy access. It does sit next to a noisy busy road so it is a little annoying to hold a conversation on the outside deck because you have to talk so loud. The interior of the home was very clean. The outside did need a little TLC, especially around the hot tub. We just took the provided broom, swept off the entry way and removed all of the cob webs from the steps for the hot tub and around the spa. The cleaning crew did a great job under the special circumstance on our arrival day. The cabin is just furnished enough with the very bare simple basics (no spices, salt, pepper, etc). The TV in the king size bedroom would only get one channel (the remote would not control the volume or channels) and there was no remote for the TV in the queen size bedroom. We did enjoy shooting pool and relaxing in the hot tub. Overall, it isn't a bad cabin, but my taste and preferences are a little more picky and upper scale. We've stayed with Cabins USA for a number of years now and we always gotten a different cabin. Each cabin has its own "personality". The booking process is awesome, painless and effortless, especially the self check in. We will continue renting cabins from Cabins USA for years to come. We'll most likely come back for the 3rd time this year and stay with them. Thanks for making our past weekend a memorial one, again! We had a great stay, easy check in. Loved location of cabin did not have the long drive most cabins have. I would not suggest staying in this cabin for more than a weekend or a few days, because the bedrooms were very small just enough room to walk around the beds. Also up stairs you needed at least one more recliner or chair. It says its for up to 6 people but really not enough seating. Internet did not work had to be reset. Hottub was not hot enough and the button and controls were broken and messed up need to be replaced. The cabin seemed to be really clean and neat except for the floor upstairs it was a little dirty. We could not find a broom to sweep which is not good for anyone staying more than a few days. The first time we used Cabins USA the cabin was amazing. So my expectations for this one were high. A Mountain Escape was right on a busy road and there was no view. The location to get to things was good . There were 3 of us and I feel 4 would have been the max. The stairs to go from bedrooms on lower level to upper main level were steep and narrow. This cabin was okay but I would not book this one again. You make your own fun and we did. Thanks to the Realty Company for putting us up here after the electric went out at our previous cabin. Truly appreciate it! We had a wonderful time staying at Cabins USA rental near Dollywood. Our rental was VERY close to the road, so there was some loud noises of cars passing through the night. The cabin was rather small and had an unusual layout with the kitchen and lounge areas being upstairs and the bedrooms downstairs. The cabin was great since we were just using it to sleep at night and not hang out in. I would recommend this cabin if you're just looking for a place to lay your head at night. Not ideal for hanging out and enjoying the smokies! The staff was very friendly and accommodating! The location was near Dollywood, which is one of the reasons why we booked the location. Not a very scenic view, but a great cabin in general. Thank you for taking the time to let us know about your recent stay in A Mountain Escape. We here at Cabins USA work hard to make sure each of our guests have the best stay possible while vacationing in the Smokies. I apologize for the issue you experienced with ants in your cabin. Your comments have been forwarded to maintenance to be addressed. When you are ready to stay with us again, please mention you are a return guest for an additional discount. Thank you for choosing Cabins USA and we look forward to having you as our guest again! My cabin stay at A Mountain Escape was enjoyable. I stayed the weekend of July 4, 2016 for 5 days, 4 nights and received a great value for the price at this time of year. The booking and check-in processes were simple and efficient...no issues at all. I arrived late in the evening on the first day and the check-in staff made sure to check in with me prior to my arrival to ensure I had no issues checking in should I arrive after office hours. Directions to my cabin were straight forward and accurate...the only issue was the visibility of the Cabins USA sign from the road at night. I passed the cabin once and had to turn around to find it, so it would be nice if some spot lighting for the sign was added for better visibility at night from the main road. Once inside the cabin, I found that it was very clean and well stocked with pretty much everything needed to start my vacation (i.e., bathroom supplies, towels, kitchen needs, laundry supplies, etc.). The bedrooms were a fairly tight fit for the furnishings, but had everything you might need with the exception of closets (there is only one open closet in the whole cabin and it's upstairs in the game room...a somewhat odd layout, but no biggie). The cabin is right off the main road and is pretty much surrounded by trees, so there isn't much of a mountain view to enjoy as with other cabins I've stayed in in the past and there is some road noise to be aware of, but none of this kept me from having a great vacation. Due to the densely wooded area surrounding the cabin and attraction of bugs to that area, I really didn't attempt to enjoy the hot tub or the rocking chairs on the top deck. I did check to see if the hot tub was clean, however, and it was. I had a few minor maintenance issues during my stay, but a call to the Cabins USA maintenance department had everything taken care of in good time (many thanks to Angie for great customer service). My one suggestion to make this cabin even more awesome would be to replace the carpet with hardwood floors...it would do wonders for it. 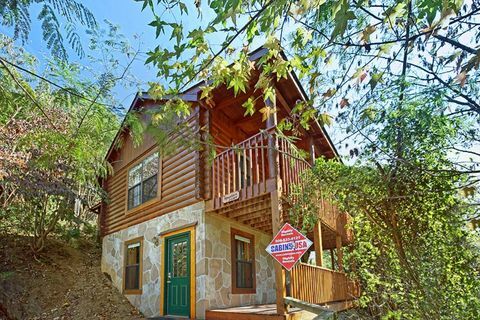 The cabin is centrally located to the Dollywood theme parks (they are literally almost in the backyard), Patriot Park, downtown Gatlinburg, and all the shopping, attractions, and restaurants on the main Parkway in Pigeon Forge. My family and I were able to get around town with ease from this location. Overall, our stay was peaceful, restful, and lots of fun. I would definitely consider staying with Cabins USA again when in the Gatlinburg area...they have made a great first impression. I am so happy to hear you enjoyed your stay in A Mountain Escape! Our staff works hard and appreciates being recognized for their excellent customer service. When you are ready to stay with us again, please mention you are a return guest for an additional discount. Thank you again for your review and thank you for choosing Cabins USA! Me and my family just stayed at The Mountain Escape over the weekend and for the cabin it was very cozy and nice. The location is great if you dont like to be far from the action of Pigeon Forge. I did find a few things that could have been better. The biggest one by far was the hot tub. Whrn we arrived it was 75° and thats very chilly. It finally warmed up by the secong night. And also all but 2 of the jets did not work. Its kept giving us an error message. Another downfall was the poll cues. The short pool cue was the only one we could use becuase of the small room and that cues tip wasnt even glued on. I had to go out a purchase billiard tip glue from Walmart to fix it so we could play. Other than that it was very nice but i would have loved for it to have been a perfect stay like so many other Cabins USA cabins. Thank you for taking the time to let us know about your recent stay in A Mountain Escape! We here at Cabins USA work hard to make sure each of our guests have the best stay possible while vacationing in the Smokies. I apologize for the issues you experienced with the hot tub and pool cues. Maintenance has been notified and will be correcting that issue. When you are ready to stay with us again, please mention you are a return guest for an additional discount. Thank you for choosing Cabins USA and we look forward to having you as our guest again! We really enjoyed our stay here. The reservation, check-in, and check-out were smooth as silk. I had to call the office after hours about a problem with the wifi password and my call was answered promptly and the staff got me fixed up right away. The inside of the cabin was very clean and well-equipped with appliances and dishes. The price (for this time of year) was better than some of the motels in the area and I much prefer the privacy of a cabin to having to share common areas with other guests. The location was very close and convenient to Pigeon Forge. There were only a few small drawbacks that one may wish to consider when deciding to stay here. The steps inside are very steep and there is only a handrail on one side. There is only one exit to ground level, on the bottom floor (if there's an emergency, it's a long way down from the 2nd floor balcony overlooking a steep bank down to the road). The cabin is located right next to a fairly busy 2 lane road, so there's a certain amount of road noise. And I would have rated the cleanliness as a perfect 10, but there is some trash on the bank below the cabin that has clearly been thrown out by previous guests (cleaning that up would be an awful lot to ask of a housekeeping staff, as it is a very steep bank). All-in-all, it's a great little place, but I wouldn't recommend it for families with small children, elderly folks, or anyone with mobility issues due to the steep stairs and single handrail. And if you're planning to attend formal functions, there are no closets or places to hang clothes. For a couple of bachelors there for the weekend, it was a pretty good fit though. I'll definitely rent from Cabins USA again, but I'll probably look for a cabin with a little more privacy and seclusion next time. Thank you for taking the time to let us know about your recent stay in A Mountain Escape. We here at Cabins USA work hard to make sure each of our guests have the best stay possible while vacationing in the Smokies. When you are ready to stay with us again, please mention you are a return guest for an additional discount. Our reservationists will also be more than happy to help you find a more secluded cabin. Thank you again for your review and thank you for choosing Cabins USA! The hot tub didn't work at all. Other than that it was an amazing Cabin to stay in for just the weekend. Great area away from the city so it is pretty quiet and peaceful. Great place! I am so happy to hear that you enjoyed your stay in A Mountain Escape. Thank you for letting us know about the issue with the hot tub. Maintenance has been notified and will be correcting that. When you are a ready to stay with us again, please mention you are a return guest for an additional discount. Thank you for choosing Cabins USA and we look forward to having you as our guest again! Great cabin! We will be going back to visit. I am so happy to hear you enjoyed staying in A Mountain Escape. When you are ready to stay with us again, please mention you are a return guest for an additional discount. Thank you again for your review and thank you for choosing Cabins USA! Your staff was pleasant and really did work to help us . Our stay was great, we enjoyed our cabin and look forward to our NEXT Cabins USA getaway! THANK YOU! The front porch needs some kind of light. Its ok when the hot tub lights are on but trying to situate my robe, towel, and phone in the dark is a little difficult. We were impressed with the cabin...no more hotels for us! Internet and phone access in the mountains can be skechy but we had no problems. Love the decks and the hot tub. Located close to the road but didn't bother us. Thank you so much for all of your kind words! We work hard to make sure that each of our guests have the same great stay you enjoyed while vacationing in the Smokies. When you are ready to stay with us again, please let our reservationists know you are a return guest for an additional discount. Thank you again for your review and we look forward to having you as our guest again! Very easy process and I was very satisfied when talking to the employees. Our coffee pot didn't work and we were able to get one right away without any problem. I would definitely recommend this company to any of my friends. Thank you for taking the time to let us know about your recent stay in A Mountain Escape! Our staff works hard to make sure that each of our guests received the best service possible while visiting the Smokies. When you are ready to stay with us again, please let our reservationists know you are a return guest for an additional discount. Thank you again for your review and we look forward to having you as our guest again! We had a great stay in the cabin. It was clean and comfortable. I would have given it a "10" across the board but the cabin was closer to the main road than I would like so that made it a little difficult to sleep in due to traffic noise and the wi-fi password they gave me for internet access did not work due to the fact that a previous renter had factory reset the wi-fi router and the internet password had defaulted to the Xfinity password which could only be attained by calling Xfinity. But overall our stay was great and we will use Cabins USA again in the future! Thank you for choosing Cabins USA. We are delighted you enjoyed your stay with us at A Mountain Escape. We apologize for the inconvenience you experienced regarding the internet. We are delighted we were able to access the password for you. Please feel free to call us for your next getaway and allow us to assist you in finding a cabin in the perfect location. We hope to hear from you soon. Cabin was a little close to road, much more than preferred but the comfort and location was wonderful! Would stay again. Loved the property & the staff was extremely pleasant and helpful. Plan on bringing the whole family up very soon!! the whole experience was wonderful. Booking with cabins usa has always been satisfying for me I wouldn't use anyone else. Great cabin and super friendly employees! We will be coming back! I enjoyed the cabin very much, I would recommend the kitchen be checked each time of cleaning. Not enough utensils for eating. The table has 2 sides the made it larger and both sides were broke. That will not stop us for renting a cabin with USA again. Our stay was enjoyable. We were pleasantly surprised with the cleanliness and comfort of our unit. We were able to have family from the area stop in for a grill-out with plenty of space for everyone to move freely. The cabin location was very private but with just a short 5 minute drive, we were back in the heart of pigeon forge. We look forward to our next visit. we have been to the area many times but this was our first experience in a cabin. we were a little disappointed that we were right on a main road. the traffic noise at night was really loud. when we arrived our hot tub was only half full, we called immediately and it wasn't filled up till late the next day and there was dirt in the bottom so needless to say we didn't get to use it. also, we were a little late arriving and tried to call many times to let someone know. we were put on hold each time. when we arrived there was only one girl at the desk. phone was ringing of the hook and she finally yelled to the back and asked if someone could help. there were at least 2 other girls "goofing" off and NOT answering the phone. normally i wouldn't have complained about this but we have rental cabins ourselves and i would be very upset that was happening and reservations maybe being missed. all in all, we had a pretty good time. not sure if we would do a cabin again though. Thank you for sharing your recent experience with us in A Mountain Escape. We do apologize for the issues that you had with the hot tub and with our staff. This issue has been addressed, and a member of our management staff will be in contact with you to further discuss your issues. We do hope that you will give us another chance on a future stay. Thank you for your business. Have a great day. Our stay in the cabin wasn't bad but it definitely could have been better. The steep hill was a big disappointment especially since we inquired about that during booking. We have a 35' RV and had inquired during booking if there would be a problem parking. We were told that we should be able to park without any problems. When we tried to pull up the hill the back of our RV dragged the ground and damage was done to the tow light. We asked for another cabin and was told that all were booked. When we inquired about a refund, we were told that we could not get the $169 deposit back. We eventually had to pull our RV in another driveway which wasn't quite as steep in order to get to our cabin, even then the back end dragged the ground some but did not do any further damage. Overall the cabin experience was ok but wasn't the best. The carpet was sort of old as a result the cabin did not have a fresh smell when we walked in. Would suggest wood floors and possible throw rugs. By the second day, however, the cabin experience did grow on us, and we were able to enjoy our stay. I definitely had a grand 60th birthday celebration in Pigeon Forge/Gatlinburg with my family. I would recommend to a friend with some reservations. Thank you for your recent stay in our beautiful cabin A Mountain Escape. We do apologize that your RV had some trouble getting up to the cabin. I also apologize that the customer service representative that helped you make your reservation did not realize how big your RV was. We do have several cabins that will allow you to park RVs in the driveway. That unfortunately was just not one of them. I am glad that you enjoyed your trip nonetheless and we do hope to see you again in the near future. Thank you again for choosing Cabins USA! This was our first time staying in a cabin and I must say it was great. We got a spacious cabin for the same price as a one bedroom cabin. I had a few issues but they where handled with care and consideration. Thank you USA for the great experience! There are a lot of things in the Pigeon Forge and Gatlinburg area that are just tourist traps designed to milk people for as much cash as they can, but hey that's typical. I have been to the area twice and stayed with USA cabins both times. I would have to say that above all, "money for value", the accomodations have been by far the front runner. Sure you can find really cheap hotels to stay in, but if you are going to stay for more than a couple of days, you simply most consider a cabin. They have more room and privacy and give you a place to relax after spending all day at Dollywood or walking around shopping at Gatlinburg. We had an issue with our hot tub the first night there. It was after 9:00pm so they didn't get anyone out till the next day, but it was taken care of quickly. The cabins were clean, comfortable, and very homey. I could not imagine trying to stay sane in a hotel room for 5 nights with a 5 yr old and 10 yr old, after running them ragged all day sight-seeing. The cabin gave us a home to return to, that allowed the kids to play, watch TV, splash in the hot tub, and just be able to relax. Give USA cabins a try!!! You will be happy you did. Thank you for choosing Cabins USA. We are so pleased to see that you enjoyed your stay in A Mountain Escape. We do have some cabins that are more private if that's something you would be more interested in. You may call one of our reservation specialists and we will be more than happy to help you find the cabin that will fit your needs. We look forward to seeing you soon.